The 2017 World Series between the victorious Houston Astros and the Los Angeles Dodgershas a strong argument to be the greatest series of baseball in the entire one hundred and fifty year history of Major League Baseball. What follows is the only World Series article you will ever need to remind yourself of a record-shattering series filled with some of the most exciting games that anybody could witness. This World Series had so many interesting angles leading up, through, and afterward, that it can only be appreciated by digesting a large volume of factoids all in one go. Bookmark this article so you can regale the story of this season to your grandkids! ed. note: This article could not have been written without leaning heavily on the great coverage of countless baseball writers and video crews over many different formats. The author has added links to every source where information was obtained, and encourages baseball fans to view that content in its entirety. What else are you going to do during the off-season? In 2014, Ben Reiter of SI.com wrote an article in which Astros’ GM Jeff Luhnow stated that the Astros had their sights set on a 2017 World Series championship. Not only did the Astros 2017 Win shatter the so-called “SI cover jinx”, but Springer went on to win the World Series MVP award, making SI.com doubly prophetic. In an amusing twist, the jinx is actually still intact. Earlier during 2017, Sports Illustrated proclaimed the Dodgers to be the best team EVER. This superseded the older jinx. In August, Category 4 Hurricane Harvey slammed into southeast Texas and sat on top of Houston for several days, causing between $20 to $200 billion in damages. Harvey caused so much flooding that it warped the Earth’s crust. The hurricane displaced as many as 60,000 Texans from their homes. After moving their home series with the Texas Rangers to Tampa Bay, causing public backlash against the Rangers, the Astros lost only three games at Minute Maid Park for the remainder of the season. The incident caused the city, and the Astros, to adopt the “Houston Strong” motto. The Astros wore the patch on their uniforms for the rest of the season, and kept photos of flooded homes in their lockers for reminders of who they played for. The Astros were Major League Baseball’s best offense, and it wasn’t close. The Dodgers’ big mid-season acquisition was Yu Darvish, in a trade from the Astros’ cross-state rival Texas Rangers. The deal for Darvish went down with two minutes remaining at the July 31 non-waiver trade deadline. The Astros made their big move by trading for the Detroit Tigers’ starting pitcher Justin Verlander, literally two seconds before Verlander would be past the deadline to allow him on Houston’s postseason roster. Verlander went undefeated as an Astro, finishing 5-0 in the regular season with a 1.06 ERA and 43 strikeouts in 34 innings. His success was attributed to the Astros’ analysis and correction of his slider delivery using high speed cameras during bullpen sessions. The Astros and Dodgers combined for eighty three years’ worth of Championship drought. For the first time since 1970, both teams in the World Series won 100 games or more during the regular season. The Dodgers won 104 games, and the Astros 101. —2B Jose Altuve of the Astros, who hit .346/.410/.547 (160 wRC+ ,7.5 fWAR) with 24 home runs and 32 stolen bases. Altuve led the American League in hits for the fourth season in a row and posted his sixth-straight 30+ SB season. See this amazing Tweet by Daren Willman of www.baseballsavant.mlb.com: a chart showing that Lance McCullers Jr. pitched 24 straight curveballs to finish out Game 7 of the ALCS against the Yankees, his first career Save. Since 2008, no other pitcher has thrown more than 14 curves in a row at any point. The World Series featured the club with the largest analytics department (Dodgers) against the club most aggressively applying analytics, according to Keith Law. The sabermetrics arm of baseball fandom crowed over the victory of having these two teams on the game’s biggest stage. The Astros were the first club to beat both the Boston Red Sox and the New York Yankees in the Divisional and League Championship Series. The Astros were the first club to win a pennant in both the National and the American Leagues. Prior to the World Series, the Dodgers’ bullpen had been riding a 28-1/3 inning scoreless streak. RECORD: This was the hottest ever World Series game at start time, at 103 degrees: . ODDITY: Astros starting pitcher Dallas Keuchel, after six years in the majors, had never previously faced the Dodgers. With Keuchel’s first pitch, Center Fielder Chris Taylor knocked a home run. Taylor, a former shortstop for the Mariners, had a career line of .234/.289/.309 (69 wRC+) coming into the season. During 2017, he batted .288/.354/.496. ODDITY: The Astros, as noted above, the least-striking-outingest team in baseball, K’d eleven times against Dodgers starter Clayton Kershaw. After the game, pundits waxed poetic about how Kershaw had finally shrugged off his playoff demons. It would not last. ODDITY: Kershaw’s eleven strikeouts were the most by any pitcher against the Astrosall season. It was also the fourteenth double-digit strikeout game by a Dodgers pitcher in the postseason. Third Baseman Alex Bregman provided all of the Astros’ offense, contributing a couple of long outs plus a solo home run in the 3rd inning that tied the game. 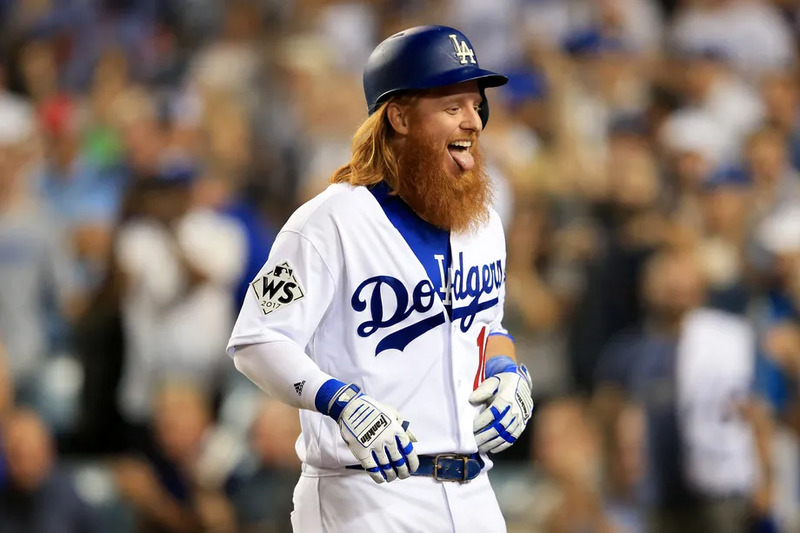 HOW IT WAS WON: After getting beat on his first two at bats, Justin Turner switched batsand hammered a two-run homer to left field in the sixth inning. ODDITY: Turner’s home run exited at 96 mph at a 37 degree angle. Per Statcast and baseballsavant.mlb.com, that batted ball had only a 13% chance of even being a hit. But it left the park. After Game 1, George Springer was batting 0-for-4 with four strikeouts, and Social Media wanted him benched. Keep that in mind for the rest of this article. Game 2 looked like a pitcher’s duel through seven innings. Then, all hell broke loose. From the eighth inning on, there were four lead changes and six home runs hit. ODDITY: The Dodgers had only five hits during the eleven-inning Game 2. Four of those hits were home runs. Two of those homers counted for the only two hits allowed by Astros starting pitcher Justin Verlander. Much like the Dodgers’ Taylor, Astros left fielder Marwin Gonzalez also had a career year. During his first five major league seasons, he was a below-average hitter, with a line of .257/.298/.389 (90 wRC+) while serving as the Astros’ utility man. During 2017, Marwin was almost an All Star, batting .303/.377/.530 with 23 home runs (144 wRC+, 6th-highest in the American League and second only to Altuve on the team). He tied the game in the ninth inning with a solo shot. ODDITY: Dodgers closer Kenley Janson had previously thrown 632 cutters in 0-2 counts. Only two of them had ever been hit for home runs, both in 2016. Those were also the only two home runs he had ever allowed on a 0-2 count. Marwin’s game-tying home run in the ninth was on a 0-2 cutter from Jansen. That was the first game-tying homer in the ninth inning or later for a road team in the World Series since 1975. ODDITY: There were a lot of strange plays in this game, the first of which was an RBI single by Alex Bregman that should have been a double. Would have been, even, had the ball not caromed off the bill of Chris Taylor’s hat and directly into the path of Joc Pederson’s glove. And then, there was the guy who jumped into the Astros’ bullpen with the intent of…who knows?…shanking somebody? That didn’t end well for him. UPDATE: And THEN, there was the pick-off attempt that hit umpire Laz Diaz, preventing a Dodgers runner from advancing. RECORD: In Game 2, the clubs set a record for most combined home runs in a World Series game, with eight. He also licked his bat. Several times. Unknown at this time if this was the most number of bat licks by a player during a single World Series game, but it is probably safe to assume that it is. Puig also made an almost-amazing almost-catch that resulted in a ground-rule double when the ball deflected from his glove. Though he was visibly frustrated, the play helped the Dodgers. Had it not deflected, it likely would have resulted in a triple for the Astros instead of a double, because nobody was close enough to easily recover a ball deflected off the wall. RECORD: The Astros were the first team in postseason history to homer in the ninth, tenth, and eleventh innings of a game. The last time any team has done it in the regular season? It has been at least 109 years. ODDITY: In the 10th inning, the Astros belted back-to-back solo homers and a double off of Dodgers’ reliever Josh Fields. Fields was traded by the Astros to the Dodgers in 2016. Puig was amused by Carlos Correa’s bat flip. ODDITY: The Dodgers then tied the game in the bottom of the 10th on an RBI by also-former-Astro Kiké Hernandez, who was traded away during the 2014 season. Game 3 action paled in comparison to Game 2, although the Dodgers slowly clawed their way back to make it a tight game when the Astros’ offense all but disappeared once Darvish left the game in the second inning. More interesting than the game itself were the several series-defining story lines that generated from Game 3. HINCH’S BAR FIGHT: During the off day, TMZ reported that Astros manager A.J. Hinch got into a bar fight with heckling Dodgers fans, requiring the police to be called. Hinch vehemently denied the story as a total fabrication. The police said that they intervened in a verbal spat, but there were no arrests, and Hinch was not identified. THE CULTURAL DIVIDE AND AMERICA’S OUTRAGE: This is 2017, and that means America must have its outrage outlet. Providing that service was Astros’ first baseman Yuli Gurriel. While yapping with teammates in the dugout after taking deep Dodgers’ starter Yu Darvish in the second inning, Gurriel was caught on camera making a racist gesture that was clearly aimed at the Japanese/Iranian Darvish, and also later admitted to using a slur. Predictably, the media and social media lost their collective minds. Gurriel, who had previously played professional ball in Japan, was rude and grossly inappropriate, and he made a statement afterwards apologizing and offering to meet with Darvish. Darvish took the high road. To the outrage of Dodgers fans and social justice warriors alike, MLB punished Gurriel with sensitivity training and a five-game suspension…that will start during the 2018 regular season rather than in the World Series. In an “all’s well that more-or-less ends well” moment, in his first Game 7 plate appearance versus Darvish, Gurriel removed his cap and tipped it in respect. BALLGATE: Darvish actually seemed more concerned with the quality of the World Series baseball, claiming that it was slicker, which affected his ability to throw his slider. SI blew the story up with a special report after Game 3 that included corroborating quotes by several players and coaches. Those included Astros pitching coach Brent Strom, who offered two ball side-by-side in comparison that showed different material. Astros’ starter Lance McCullers even took a blindfolded test, correctly identifying World Series baseballs by feel every time. Major League Baseball predictably shrugged off the implications, stating that the only difference between the World Series balls and regular season ones was gold stamping instead of blue. Fangraphs followed up with a data-driven analysis of World Series pitchers and their breaking balls. Fangraphs concluded that, yes, there may be fire behind all this smoke. After all, when you have future Hall of Famer Justin Verlander complaining that he couldn’t get a slider grip and that ink runs right off the ball, and future Hall of Famer Clayton Kershaw visibly struggling all series to control his slider, one should pay attention. Add in Darvish’s struggles, Brad Peacock saying in a post-game interview that his sliders were garbage, and slider-heavy closers Ken Giles (HOU) and Kenley Janson (LAD) both uncharacteristically getting destroyed, it lends credence to the story. On the other hand, maybe not? BRAD PEACOCK, TANDEM STARTER: Part of the Astros’ rebuild process included using a tandem pitching strategy in the minor leagues to identify more budding starters. They would pitch one starting pitcher for four or five innings, and then another starter would throw the remaining innings. The tandem starting system was criticized by several former Astros minor league pitchers and also by outside pundits. In Game 3, the Astros utilized a tandem starter strategy to protect the team from a bullpen that had become suddenly shaky during the second half of the season. During the regular season, Brad Peacock entered the starting rotation when Lance McCullers landed on the Disabled List. In total, the two pitchers ended up starting forty three games for Houston during 2017. Not only did Peacock have a renaissance season (3.00 ERA and 161 in 132 IP, including 21 games started compared to a previous 4.57 career ERA), but during the World Series he played the classic “stopper” role. In four appearances during the series, all in relief, he allowed only two runs in seven and one-third innings, despite admitting that he had no feel for his slider. Perhaps because of Ballgate, Peacock threw 81 fastballs out of 103 pitches during the World Series. Dodgers batters hit .091 against his sinker. RECORD: Peacock’s 3+ inning, no-hit Save (the first of his career) was also the first in World Series history. Charlie Morton would later pitch the second. Dodgers starter Alex Wood took a no-hitter into the 5th inning, until it was broken up by Springer’s third home run of the series. Alex Bregman homered later also. From that point the game trickled onward. The Dodgers tied it in the seventh on a single by 2B Logan Forsythe, and it stayed tied at one until a ninth-inning meltdown by the Astros bullpen; Joe Musgrove allowed two runs, and then closer Ken Giles allowed three more. Bregman’s World Series could be the beginning of a national reputation as a flashy and accurate defender at third base. In Game 4, he nabbed catcher Austin Barnes after fielding a tough chopper. The play was reminiscent of a spectacular play to catch Yankees’ 3B Todd Frazier at the plate in Game 7 of the ALCS. Bregman ended up having a defensive series for the ages. In fact, Bregman’s glove is one of three artifacts that is headed to the National Baseball Hall of Fame to represent the 2017 World Series. HEROES OF THE GAME: Good grief. Bregman, Altuve, Springer, Gurriel, Taylor, and Bellinger all had WPAs of over 0.30. I guess we’ll give partial credit to Joe Musgrove (HOU) for being the only pitcher in the game to have at least an appearance that lasted at least an inning without giving up a run (out of 14 total pitchers). If Game 2 was universally hailed as one of the best games most baseball fans have ever seen, then Game 5 could be described as the silliest one. To start, Home Plate Umpire Bill Miller’s strike zone was…original. To say the least. The best that can be said about it was that it was evenly awful and didn’t favor either club. Miller was well-roasted by the Burbank Police Department, and … well … they weren’t far off from the truth. Two thousand words could be written about the weirdness of this game. Instead, just check out this link. More 400 pitches thrown! Twenty eight hits! Eleven walks! Exploding baseballs! Bunting clean-up hitters! Aces wild! This game had it all, ending with an SEC Football score. ODDITY: Despite a strike zone the size of Texas that should have benefited the pitchers, still this game was dominated by offense. RECORD: The Astros were the first team ever in the World Series to have five different players hit a home run in a single game. RECORD: By allowing his home run in the fourth inning, Kershaw set a new record for most homers allowed in a postseasons by a single pitcher, with eight. RECORD: This was also the first World Series in which four different players aged 23 or younger hit a home run. RECORD: Game 5 was the highest-scoring extra-innings game in the history of postseason baseball. RECORD: And finally, this was the first postseason game in history in which three game-tying home runs were hit. Not a record, but Game 5 was the second-longest World Series game ever, at five hours and seventeen minutes. Incidentally, the Astros played the longest World Series game ever, back in 2005. This game was much more baseball-y than Game 5. The Astros got out to an early 1-0 lead on a solo homer by Springer in the 3rd inning, but the dodgers clawed their way back to even up the series. ODDITY: Game 6’s starting pitcher for the Dodgers, Rich Hill, was almost signed by Houston during the off-season. One wonders what series of dominoes would have fallen had he landed with the Astros, and what the results of the season would have been. Would the Astros be in the World Series with Hill? Would the Dodgers without him? Would Hurricane Harvey have never come? The world will never know. The most noteworthy thing that happened during Game 6 was the Dodgers winning it. Because it couldn’t be the greatest series of baseball of all time had it ended after only six games. By this point, the two World Series managers, A.J. Hinch of the Astros and Dave Roberts of the Dodgers, had firmly established how they were going to use their pitchers. While Hinch seemed more patient and willing to play out a hot hand (a-la Peacock in Game 3), Roberts at times seemed as if he had written a script and intended to stick with it no matter what. 1. A reliance on only four relievers (Jansen, Maeda, Morrow, and Tony Watson were the only Dodgers relievers to pitch more than 3 innings. Jansen pitched eight and two-thirds innings, more than any Dodgers pitchers except for Kershaw. 2. A hell-bent policy of pulling starter Rich Hill before facing the Astros lineup for a third time. One one hand, perhaps this worked, since Hill finished the series with a 2.08 ERA. On the other hand, who’s to say Hill could not have continued pitching well? 3. Sticking with Darvish as the Game 7 starter despite warning signs that things just were not right with the pitcher (more on that in a sec.). According to ESPN’s Buster Olney, Roberts’ 28 pitching changes made during the World Series was only two shy of a record. Hinch, on the other hand, decided to save his best bullets for Game 7, once the Dodgers took the lead. Ironically, it was regular season whipping boys Luke Gregerson and Francisco Liriano that held Los Angeles scoreless in Game 6. And so, Game 7 at last. An already historic series goes down to the ultimate winner-takes-all game. Game 7 was the only game of the series during which one team took a lead and did not relinquish it. The Astros hammered starting pitcher Darvish, who again exited in the second inning, and never looked back en route to their first World Series Championship. The Astros’ McCullers somehow managed to overcome hitting four batters in two and one-thirds innings to hold the Dodgers scoreless. He was followed by Liriano and Chris Devenski, then by two innings of dominance by Peacock, and finally four blistering shut-down innings by Charlie Morton, who looked as if he didn’t realize that this was the biggest moment of his professional career. He hit 99 mph on the gun and limited the Dodgers to one run on two hits and a walk. ODDITY: That was Morton’s second career relief appearance, and his first since 2008, his rookie season. EVEN ODDER: Both of Morton’s relief outings, nine years apart, were to the same catcher: Brian McCann. One of the hitters faced in that 2008 relief appearance? 2017 teammate Carlos Beltran. RECORD: Both starters failed to pitch three innings. That had never happened before in a World Series. RECORD: No starting pitcher has ever hit 4 batters in a World Series game. Lance McCullers can hang that one on his record wall. After the game, it was reported that Darvish may have been tipping pitches during the game. This, on top of the fact that he was reportedly bouncing pitches during warm-ups before Game 7 should have Dodgers fans questioning their club. Why did the Dodgers start Darvish at all, if he was that messed up? Additionally, it seems possible by his previous comments that the “slick ball” had gotten into his head. Furthermore, if folks watching on TV could pick out his pitches before he threw them, and if the Astros likely could, then what about the fellows paid by the Dodgers to recognize such things and correct them? Championships are never decided on just one decision or moment – they are the sum of a zillion things that could have been different, if only they were…different. But one has to wonder how Game 7 would have gone for the Astros had Darvish stayed out of the game and the Dodgers had started Kershaw or Wood instead. The Astros had been struggling on the road throughout the playoffs, and inexplicably, the Dodgers went with a starting pitcher who clearly wasn’t right. Why? RECORD: With his home run in Game 7, George Springer set a record by homering in four World Series games in a row. RECORD: Speaking of Springer, his five home runs in a World Series tied “Mr. October” Reggie Jackson and Chase Utley’s record. RECORD: Still sticking with Springer, his twenty nine total bases during the World Series also set a new record. RECORD: In fact, that was a postseason record as well! RECORD: And let’s add in his eight extra base hits, which set a World Series record. RECORD: It gets sillier – Springer was the first player with extra base hits in six consecutive World Series Games. Sadly, not a record: Springer was the second player to hit a game-tying or go-ahead home run in three consecutive World Series games. The first? Lou Gehrig in 1928. RECORD: The ball was flying – after the series ended, a new record was set, with fourteen players who hit at least one home run. RECORD: That record led to another: Twenty five total World Series home runs between the two clubs. RECORD: Poor Bellinger. His seventeenth strikeout set a new World Series record for futility at the plate. RECORD: Dodgers reliever Brandon Morrow tied a record by being only the second pitcher in history to play in all games of a seven-game World Series. RECORD: Four different Astros pitchers threw at least three and two-thirds innings to finish a game in the postseason: Morton, McHugh (ALCS Game 3), McCullers (ALCS Game 7) and Peacock. The previous record was two, and as noted above, none were in the World Series. In a combined 163 at-bats prior to the World Series, the Astros hit only .190/.249/.288 against Darvish. During the World Series, in 3-1/3 combined innings between two starts (the other being Game 3), Houston tagged him for nine runs. RECORD: Lance McCullers recorded the first RBI ever by an AL pitcher in a World Series Game 7. The Astros’ 2017 World Series Championship was their first in the fifty five year history of the club. The Astros beat the #3, #2, and #1 payroll teams, in that order, en route to their Championship. The Astros’ opening day payroll? 18th. Brian McCann’s interview with John Smoltz, stating that Charlie Morton had the best stuff of any pitcher that McCann had caught for. Smoltz, a Hall of Famer, pitched to McCann when they both played for the Atlanta Braves. Charlie Morton: Injury-plagued journeyman pitcher who totaled only 17 innings in 2016, becoming a 2017 World Series hero by throwing 99 mph coupled with a back-breaking curveball. Carlos Correa proposing to his girlfriend during an interview with FS1’s Ken Rosenthal. Justin Verlander missing the World Series parade to marry uber-famous model Kate Upton in Italy. Beltran, Astros 2004 postseason hero, returning to the Astros at age 40 to win his first World Series. Astros Catcher Juan Centeno was on the roster for all three playoff series…and never saw a plate appearance. Both the Dodgers and the Astros scored 34 runs. Talk about evenly matched! The Dodgers and the Astros both are well set up to be two of the most dominant teams of the next several seasons. Maybe longer. Here are some unofficial awards for World Series performances, handed out by the Crawfish Boxes. SERIES MVP: George Springer (HOU). Number four batted .379/.471/1.000 with 11 hits, 3 doubles, 3 walks, and 5 home runs, making this one of the greatest offensive performances, if not the greatest, in World Series history. SERIES CY YOUNG: Charlie Morton (HOU). In ten and one-third innings including one start and one relief appearance, Morton allowed only two earned runs (1.74 ERA) while striking out eleven and only walking one. Runner-up: Alex Wood (LAD), Rich Hill (LAD): Wood took a no-hitter into the fifth inning of his start and ended up with a 1.17 ERA in seven and two-thirds innings. Hill, in his two starts, posted a 2.08 ERA with twelve strikeouts and four walks. FIREMAN OF THE SERIES: This has to go to Brad Peacock (HOU) who in seven and one-third innings over four games, struck out eight on his way to a 2.45 ERA…all while relying almost solely one one pitch, a sinker that the Dodgers’ batters just couldn’t figure out. Runner-up: Kenta Maeda (LAD): 1.59 ERA over five and two-thirds innings in four games. THERE’S ALWAYS TOMORROW: Cody Bellinger (LAD). .143/.172/.393 with 17 strikeouts in 29 plate appearances. Tough going for the likely NL Rookie of the Year. Runner-up: Josh Reddick (HOU). .167/.231/.208. His one additional walk and twelve fewer strikeouts keep him out of the top spot. BATTING PRACTICE: Yu Darvish (LAD) – nine earned runs in three and one-third innings. Yowch. Runner-up: Ken Giles (HOU). The Houston closer was for all intents and purposes benched mid-series after hemorrhaging five earned runs in one and two-thirds of an inning. WORST HAIR: Turner. No contest. BEST HAIR: Gotta give it to Puig. His ‘do screamed “all in” on this whole World Series thing. TWENTY SIX records smashed, setting ridiculous performance bars for future World Series. Has there ever been a better series of baseball containing so many interesting narratives both between the foul lines and outside of them? Doubtful. This World Series will be remembered fondly by baseball historians for the next hundred years. Or more.